Rounded up the family and headed over to the nearby skate-park for a local event sponsored by Level2 Skate Company and Pilot International. Pilot International is a very worthwhile organization that focuses on brain-related disorders and prevention of brain injuries. They were generous enough to be handing out free helmets to anyone that needed one. Our boys really haven’t seen this level of skateboarding up close and in person. The heat really didn’t stop the Level2 Team and competitors from going all and putting on a great show. We met some really great people while we were there and I’m guessing the boys will be asking to go to the skate-park from time to time. As for the images, the event took place from noon to 2:00 – not the most desirable time of day to be taking pictures with the sun directly overhead, which typically cast some pretty bad shadows on your subjects faces. However, in this case the concrete of the skate-park worked as one giant reflector and bounced plenty of light from below resulting in some really nice shots. 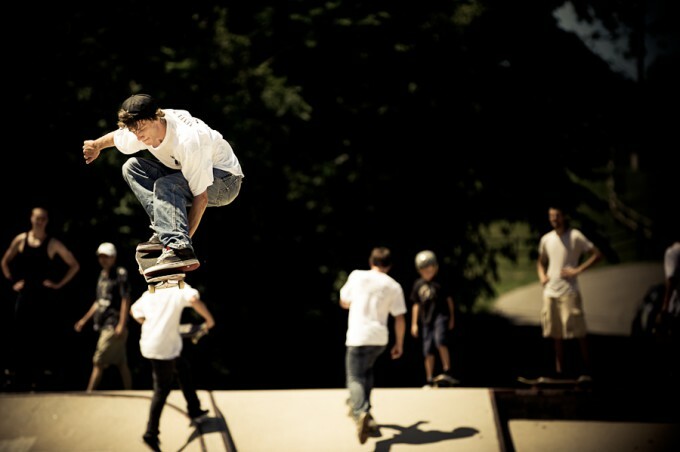 All that aside, photographing skateboarding was a blast – lots of great action and interesting subjects. Can’t wait to do it again.